by Robert Buchanan (adapted from the novel, Fromont Jeune et Risler Ainé by Alphonse Daudet). London: Haymarket Theatre. 5 January to 24 March 1888 (81st performance). New York: Madison Square Theatre. 2 to 28 April, 1888. Birmingham: Prince of Wales’s Theatre. 28 August, 1891. MR BUCHANAN’S new comedy-drama is in active rehearsal at the Haymarket. It is in four acts, and will be entitled The Senior Partner. The cast will include Miss Marion Terry, Miss Achurch, Miss Le Thiere, Mr Brookfield, Mr Kemble, Mr Lawrence Cautley, and Mr and Mrs Beerbohm-Tree. The statement which has been circulated, to the effect that this play is a mere adaptation of a French novel, is without foundation. Though several suggestions have been taken from a foreign source, the work is in the main original. MR ROBERT BUCHANAN has given up the title of The Senior Partner for his new piece at the Haymarket, and has decided to call it The Honour of the House. The new piece written by Robert Buchanan for the Haymarket will be called “Partners.” The play, which was to have been produced on Saturday, will not be brought out until Jan. 5. In addition to the regular company of the Haymarket the services of Misses le Thiere and Kingston have been secured. The latter lady is a well-known professional beauty who has had some experience in the provinces. She will be intrusted with an important rôle. The story of the play is as follows: An old German merchant is possessed of a beautiful wife, with whom his partner falls desperately in love. The German trusts both man and woman implicitly, despite the warnings of friends and enemies. During her husband’s absence on the Continent the wife has a passionate love scene with the partner, in which she confesses her love. He urges her to flee with him, which she is about to do, when the voice of her child is heard calling her from an adjoining room. This brings her back to her proper self, and she refuses to betray her husband. This is an excellent scene, and although the idea has been used before Buchanan’s treatment of it is forcible. The husband returns after being ruined by the failure of a Continental firm. From a conservatory he sees the two together and hears the woman avow her love for Charles, but he does not hear her avow that gratitude and respect preclude her from wronging her husband, even if the motherly love stirred by the voice of her child was not sufficient. Further, he is poor now, and her duty compels her to remain. The husband’s eyes are at last opened, and in a strong scene he drives her from his house without listening to her story. In the fifth act it is Christmas, with its sacred and peaceful associations. The old man’s heart, touched by the gladness around him, breathes forgiveness on his wife and partner, and the curtain falls on a holly-decked apartment in which once more reign domestic peace, happiness, and love. In a note appended to the bill of his new play of Partners, which was produced at the Haymarket Theatre last night, Mr. Robert Buchanan intimates that the principal character, Heinrich Borgfeldt, is “founded upon that of Risler in M. Alphonse Daudet’s novel of ‘Fromont Jeune et Risler Ainé,’ but that, while numerous suggestions have been taken from the book, the leading situations and most of the dramatis personæ are radically different.” It would be easy to join issue with Mr. Robert Buchanan upon the question of his alleged independence of M. Daudet’s novel, but this would be a needless as well as an ungracious task. We quote his acknowledgment of the source of his inspiration in connexion with Partners not for the purpose of proving, what is already well known, that an adapter is apt to develop something of a foster-mother’s fondness for the little foundling under his charge, but because it explains certain of the imperfections of the piece, which the first-night public noted with their accustomed frankness. “Fromont Jeune et Risler Ainé” is unsuited to dramatization. M. Daudet himself has attempted the task and failed. Mr. Robert Buchanan has no doubt been wise, therefore, in endeavouring to shake himself free of the trammels of the novel; but the charm of that intensely realistic book has evidently pursued him throughout his undertaking to the extent of crippling the imaginativeness and the apt observation of character of which on other occasions he has given abundant proof. Regarded as an adaptation, Partners is a work of skill; the only question it raises is whether Mr. Robert Buchanan has not unduly handicapped himself in transplanting to London a story and a set of characters essentially Parisian in their growth, and governed by a code of morals which the Lord Chamberlain has not yet seen his way to accept. The character of Heinrich Borgfeldt, which is taken by Mr. Beerbohm Tree, retains the German habits of thought and speech, the uncouthness, the goodheartedness, and the crowning domestic sorrow of Risler. He has, however, ceased to be a designer of wall-papers and become a partner in what appears to be a financial house in the City—a circumstance which it must be confessed is somewhat incompatible with the childish simplicity of his nature. Nor does the actor help materially to explain the part, which suffers in an unusual degree from the difficulties of adaptation. It would not be easy, we fancy, for Mr. Beerbohm Tree or Mr. Robert Buchanan to discover at the head of a great City firm an elderly German combining with the most primitive tastes the appearance of an impecunious music teacher, and incapable, after 20 or 30 years’ residence in this country, to speak English without a plentiful intermixture of such expressions as “nein,” “ja wohl,” “mit mein wife,” and “auf Wiedersehen.” These are small matters no doubt, and Mr. Tree or Mr. Buchanan might urge with some show of reason that the German attributes of the character require to be accentuated upon the stage. Still, such manifest exaggerations are apt to detract from the value of a study of character, or at best to lessen one’s faith in the truthfulness of the actor’s or the author’s observation. In addition to Risler, we discover in the cast, under the name of Charles Derwentwater, the younger Fromont, who endeavours, as in the book, but without the same success, to detach the young and flighty Madame Risler from her wifely duties. We meet also with the faithful cashier, M. Planus, renamed Mr. Parr, and with the “illustrious Delobelle,” the tragedian out of employment, who reappears as Mr. Algernon Bellair. Sidonie, the Madame Risler of the original, is a thoroughly corrupt creature, vicious by instinct, and impossible as a type of character in an English play. Mr. Buchanan has changed her into a weak, undecided, but on the whole well-meaning woman, who allows herself to be drawn into a somewhat serious flirtation and to inspire her friends, including an ingénue sister, with the dread that their friendly offices to save her from the effects of her indiscretion may be “too late.” Such hybrid types are seldom acceptable to a theatrical audience, who demand, above all things, clearness of outline, alike in character and situation; but it is obvious that the adapter having taken M. Daudet’s story for better or worse was unable to help himself. The character of Madame Risler in the new version owes much to Miss Marion Terry, who invests it with a certain amount of charm and even plausibility. Among the personages of Mr. Buchanan’s creating are Gretchen, a child of the Rislers, who helps to bring about the inevitable reconciliation between husband and wife, and who is played by Miss Minnie Terry, a juvenile débutante of the well-known theatrical family of that name; Alice, a younger sister of Madame Risler’s,; and Mrs. Harkaway, a wicked “woman of the world,” very distantly suggested by the Madame Dobson of the book, who leads the unsophisticated heroine into temptation. Alice is gracefully embodied by Miss Achurch, while Mrs. Harkaway is drawn with the necessary degree of viciousness by Miss Gertrude Kingston. Mr. Brookfield gives an amusing sketch of the impecunious tragedian, and Mr. Laurence Cautley and Mr. Kemble as the “gentlemanly partner” and the sober, staid cashier, are excellent representatives of their parts. But the interest of the play centres after all in the character of Borgfeldt, which is drawn by Mr. Tree with all his graphic detail and picturesqueness. It is another finished portrait of a somewhat eccentric cast to be added to Mr. Tree’s already well stocked gallery. Mr. Robert Buchanan’s new play, entitled “Partners,” was produced last night at the Haymarket Theatre with the most gratifying tokens of success. The story, which the author frankly acknowledges was suggested by Daudet’s novel, “Froment Jeune et Risler Ainé” is of pleasant simplicity. It concerns the ruin brought on a mercantile firm and the destruction of the domestic happiness of the senior partner by the expenditure and lax morality of the junior partner, the restoration of credit and the cementing of the household gods being brought about by the self-sacrifice and nobility of the elder man in a way not unfamiliar to the stage. Mr. Beerbohm Tree’s impersonation of this character is perhaps as fine a thing as he has ever done. Nothing could be more winning than his tenderness in the lighter phases, and little within the limits of true art more powerful than his portrayal of grief and agony in the darker moods of the part. At the termination of the third and fourth acts he was called again and again to receive the acclamations of the house. Perhaps the most striking character after that of the hero is the one played by Mr. Brookfield, who, wonderfully made-up, impersonates a retired actor with rare humour and effect. Miss Marion Terry gives a sympathetic and touching rendering of the sorely- tempted heroine. Miss Le Thière has a pleasant part, which she fills with geniality and aplomb. Miss Gertrude Kingston is appropriately gay and vindictive by turns as a wicked woman of the world. Miss Achurch is supplied (not too well) with opportunities for the display of her skill, and Miss Minnie Terry is one of the most delightful of stage children possible. Mr. Laurence Cautley plays the villain with ease and finish, and Mr. H. Kemble is admirable as an old clerk of the imperilled firm. The play will need some compression and curtailment, and then with such acting as it contains its lasting success seems assured. Whatever may be said of the new comedy drama Partners, with which Mr. Buchanan presented the public last night at the Haymarket Theatre, it can hardly be urged that it is a wholesome play. The story, though much involved, is in reality a short and simple one. It is that of a rich German merchant living in London named Borgfeldt (Mr. Beerbohm Tree), who has married—by means of money lent to her father—a young and beautiful lady, of somewhat flighty ideas, named Claire (Miss Marion Terry). He has a young partner called Charles Derwentwater—a married man, by the way—who is desperately in love with Borgfeldt’s wife, and is besides a sort of “conventional lady-killer,” whom married women generally are supposed to admire. Derwentwater ruins the firm by his extravagance, and takes advantage of the absence of his old partner—who has rushed off to Germany in order to save, if possible, the credit of his house—to attempt the ruin of Mrs. Borgfeldt also. Here sympathy can hardly be said to rest with anyone. The old German has married the girl by means of money, one can hardly weep over him; the girl herself, though petted by her old “bear of a husband,” is too openly deceptive to deserve any sympathy; the youthful partner is certainly a very stagey lover, and attracts very little interest. The only actor in the play at this time that draws pleased attention from the audience is Miss Minnie Terry, who, as the little daughter of Mrs. Borgfeldt, rushes into the room at the critical moment when her mother’s honour hangs in the balance, and presumably saves her. Presumably only, however, for the husband, returning suddenly, certainly catches Mrs. Borgfeldt in a most compromising situation, and turns her out of house and home. Still, for some inconceivable reason, while he discards his wife he retains his partner; the firm is nearly ruined, but he intends to work as a clerk, and so save the good name of the house. The partner continues with him, and at the close, on a Christmas-day, when Borgfeldt becomes reconciled to his wife, the health of Derwentwater is actually drunk in a bowl of punch. Such is roughly the story of The Partners. Of course, there are a lot of side issues in the five acts, which are successively called “Mrs. Borgfeldt at Home,” “The Junior Partner,” “The Honour of the House,” “The Senior Partner,” “The Christmas Carol”; but they do not greatly affect the spectator, though they introduce a number of actors and actresses upon the stage. This brings us to the consideration of the acting. Miss Marion Terry has a most difficult task. Does Mr. Buchanan wish to portray an innately bad woman, or one who is really good, but slips? If the latter, how comes it that she is so eager to get away from her husband to be alone in the drawing-room with Charles Derwentwater, and seizes every opportunity for a tête-a-tête with him? If the former, why send down the curtain of the first act as she sits looking sadly into the fire, and ejaculates, “If he had only stayed”? So through the whole play; her assurances that she is bewildered are always at variance with her readiness to dally with “Charles.” It is an incongruous character. As to the part of Borgfeldt, played by Mr. Beerbohm Tree, the most that can be said of it is that in point of detail and German accent it is irreproachable; but for the rest it arouses no enthusiasm, and becomes inexpressibly tiresome. The old man has very little to say, and takes ever so many words, and a very long time, to say it. Probably cut down and altered the part may have something in it—at present it is a poor one. Charles Derwentwater’s part, played by Mr. Lawrence Cautley, is not of a kind to please serious people. We know all the way through that it is an impossibility; that no such man could make such havoc with women’s hearts, and Mr. Cautley may ask himself whether it is usual to fall on the knee and clasp round the waist or catch hold of the hand of a married woman with quite so much frequency and cupidity as he portrays it. Miss Gertrude Kingston, who is a Mrs. Harkaway, a designing woman of fashion (and rival of Mrs. Borgfeldt in Charles Derwentwater’s affections), she herself being married, is very clever; but the part she has to play is repulsive. If The Partners prove a success it will not certainly be on account of its inherent goodness or the skilful representation of its leading parts. The successful Red Lamp was last night replaced at the Haymarket by a five-act play called Partners, written by Mr. Robert Buchanan. The author acknowledges some indebtedness to the well-known novel “Froment jeune et Riola ainé,” but he claims the credit of inventing many of the incidents of the drama, and this credit must be given him, though in truth most of the personages have recognisable prototypes in fiction. Partners, as will be judged from the reference to M. Daudet’s book, is the story of an elderly man, whose trust is placed equally in his young wife and in his friend and partner, and who is driven to believe, with much reason, that they are both false to him. The scheme furnishes opportunity for some remarkably powerful and affecting scenes, but a fault of the play—apart form its extreme length, which is the more inexcusable, because there is not a little repetition in it—is its persistent atmosphere of mournfulness. More than once or twice during the evening it was felt that the acting saved the play, and that but for the personal interest which some of the characters evoked, the depressing influence of the story would have brought about its condemnation. When it has been considerably shortened, it will be materially improved, and it will then remain to be seen whether, in the opinion of audiences, its power atones for its painfulness. Borgfeldt, the senior partner, in an apparently wealthy firm, is, as he supposes, happy in the possession of a charming wife, a bright little child, and a partner, Derwentwater, who, except for some indifference in the matter of business, which signifies little, is all that a partner should be. Borgfeldt knows his own shortcomings. He is clumsy, unused to society, feels strange in his handsome house, for he is unaccustomed to luxury; and, indeed, is made absolutely uncomfortable by the stateliness of his butler, whom he deferentially addresses as “Mr. Dickinson”; and here, it should be said, that it is mainly to Mr. Beerbohm Tree’s remarkably courageous and skilful handling of this character that such success as the play may gain, will be due. It seems impossible when “the old bear,” as he calls himself, first appears, with his odd constrained manner, strongly marked accent, and ungainly appearance—ill-fitting clothes, intractable hair, and general uncouthness—that he can win the sympathy, regard, and respect of the audience as he speedily does. Borgfeldt, however, is suddenly called away, almost at a minute’s notice, to Germany, and this at a time when the attachment between his wife Claire and Charles Derwentwater is passing the limits of flirtation. Her evil Genius, who, for motives of personal revenge, tempts her to her ruin is a certain Mrs. Harkaway. A passionate scene between the lovers, as they must be called, takes place one night after a return from the theatre, and Claire has ceased to repulse her husband’s friend, when her child, who has been waiting for her mother’s good-night kiss, runs into the room. To many spectators the introduction of the child in this manner will certainly convey an extremely unpleasant sensation, but it may be that this is a point of sentiment, and it need not here be discussed. Both as regards the honour of her name, and the peace of her home, Borgfeldt is only summoned home in time, if, indeed, it be held that he is in time. His faithful old clerk, Parr, sends him an urgent telegram, and the senior partner reaches London to find his business on the verge of ruin, owing to the dishonesty of his junior, and to find worse still at his home; for though in truth Claire has by this time recoiled from the danger to which she was rushing, her husband arrives in time to witness a scene between her and Charles, the nature of which he excusably misunderstands, so that he can only think that the worst has befallen him. Here the motive of the play became extremely complicated and involved. In a book, the reasons which influence Borgfeldt might be made comprehensible; on the stage they remain vague. He does not furiously denounce the villain who has striven to compass his ruin. On the contrary, Borgfeldt insists upon retiring from the firm himself and working for his guilty partner as a clerk, his reverence and affection for the memory of his old master (Mrs. Derwentwater’s father) being the reason; and of this something too much is heard. It is not exactly a heaping of coals of fire on the scoundrel’s head, but it is a complicated method of making him feel the despicable nature of his conduct. Mr. Tree had previously held together the scene in the office, spun out to undue length; and here again, though the proceedings of Borgfeldt are decidedly eccentric, the actor commanded attention, and a certain indefinite sort of esteem. As for his wife, he will not listen to her protestations of innocence, and drives her from his house. This hastiness has, of course, to be rectified in the fifth act, an act which is put together in a very loose and clumsy fashion. Borgfeldt is living in humble rooms, his child has been ill, pining for her mother, who is presently brought in by a Lady Silverdale, who has acted as a sort of good fairy. A letter, written by Claire to Derwentwater, conclusively establishes her innocence, and Borgfeldt repents his obstinacy. It was nearly midnight when the curtain fell, and there is not time to discuss certain incidents which would tempt remark if leisure permitted. The end of the piece is very weak, and Mr. Tree, not without excuse, lost, to some extent, the grip of the character which he had hitherto so firmly maintained, but, nevertheless, his study of Borgfeldt will do much to increase his reputation as an emotional actor. Miss Marion Terry displayed a remarkably acute appreciation of the character of Claire. The struggle between love and duty was shown with admirable force and feeling. That Borgfeldt should not have recognised the accents of truth in Claire’s voice says little for his perception, for they were plain to hear. Miss Le Thière gave a very agreeable representation of the benevolent Lady Silverdale; Miss Achurch acted with tenderness and sincerity as Claire’s sister Alice; and the child was prettily and naturally played by Miss Minnie Terry. Miss Gertrude Kingston was less successful as the malicious Mrs. Harkaway, Claire’s evil Genius. The actress’s own emphasis weakened her performance, which also exhibited want of savoir faire and knowledge of effect. A most humorous sketch of an impecunious actor (Claire’s father, M. Bellair) was worked out with notable freshness and unconventionality by Mr. Brookfield. The character is full of choice bits of comedy, and is the more welcome as it is the only relief the piece contains. Mr. Kemble’s Parr is an excellent study of the faithful old clerk, jealous of his master’s honour, fearless in the discharge of his duty, dignified and eminently trustworthy. Mr. Cautley gave a highly efficient performance of Derwentwater; Mr. Allan’s butler Dickinson was a model of dignity and haughtiness as such qualities are accepted in the servants’ hall and Messrs. Stewart Dawson, Eric Lewis and Miss Emilie Grattan were serviceably employed. On the whole, the reception of Partners may be called favourably, though the verdict was not quite unanimous on behalf of the play, the audience, however, letting it be seen that the good work done by the actors was fully appreciated. Mr. Robert Buchanan’s new play, “Partners,” and his curious and perverse treatment of the simplest possible story that ever occurred to novelist or dramatist, reminds one irresistibly of a cat engaged in the cruel process of killing a mouse. We all know what the cat does. It allows the mouse to run, pats it, paws it, tortures it, and takes an unconscionable time in putting the little creature out of its misery. Last night this process of slow torture was inflicted on a patient but keenly observant audience. Mr. Buchanan was the cat; his simple little plot was the harmless mouse; the cruelty was inflicted on the audience, who knew exactly what was going to happen, but were treated to a gambol that, as the long hours drew on towards midnight, proved a little wearisome. That this should be so, that the interest should flag, halt, pause, and eventually dwindle down to nothing, was inevitable when we calmly consider what Mr. Buchanan has done. He has taken the space of five long acts to tell a tale that could conveniently be told—concisely, sharply, and vigorously told—in two acts at the utmost. The story is as old as the hills, but it is none the worse on that account. Unfortunately the dramatist has in this instance hardly anything new to say about it. Nothing is gained by spinning it out, dotting the “i’s,” crossing the “t’s,” over-elaborating, underlining, insisting on the simplest dramatic points, running up to a climax and shirking it, putting the cup of excitement to our lips for the mere sake of dashing it away again. Thackeray has suggested with infinite force and excellent humanity, Daudet has elaborated with rare descriptive faculty, as a novelist is permitted to do, the story of man’s truth and woman’s weakness, the honest manly husband, the weak and badly influenced woman, the handsome, persuasive scoundrel, who play their parts with a difference, but a very slight one, in Mr. Buchanan’s new play. Mrs. Rawdon Crawley is discovered in her intrigue with the rich old Marquis of Steyne by her simple-minded and confiding husband, whose eyes are filled with dust; old Risler, the man of commerce is cheated out of his young wife’s love by his flashy and seductive partner, young Froment. Age and honesty are on this side, youth and temptation on that. It is one and the same permutation and combination of character. But, new or old, all depends on the treatment; and, regarded from the dramatic standpoint, Mr. Buchanan cannot be said to have handled it with his accustomed vigour or virility. He talks his subject away until at last he becomes positively tedious. An old man has got a darling. Heinrich Borgfeldt, a man of business, has married a young wife, and he forgets the almost inevitable consequences of the rash act. Claire, the pretty wife of the commerce-loving old German, has everything that should make a sensible woman happy—a good man’s love, a sweet child, a comfortable home, riches, luxury, and the esteem of the world—but she must needs fall under the spell of her old husband’s young married partner, who has little to recommend him in the way of talent or persuasiveness, and who, as drawn by Mr. Buchanan, is not much different from the ordinary, conventional French lover who pops down on his knees on the slightest provocation, seizes his partner’s wife passionately round the waist whenever they are left alone; the ordinary drawing-room amant, with flashing eyes and in dress clothes, who is supposed to fascinate innocent women as a serpent does a poor trembling rabbit. We have as little sympathy with Claire as for her electro-plated admirer. Neither character is well drawn. The woman is simply silly, and the man is obviously vain. However, they love, or rather they play at love-making at afternoon teas and fashionable assemblies. The infatuated Derwentwater buys extravagant diamond necklaces for his partner’s wife, the old German goes conveniently away, the crash comes, the firm is ruined, the peaceful home is destroyed, and old Borgfeldt, having discovered his wife in his friend’s arms, enters into a long business transaction, lectures, proses, explains, meditates, and eventually, on absolutely insufficient evidence of his wife’s actual guilt, turns her out of the house in a manner almost as heartless to her as she has been foolish and inconsiderate to him. Even at this point we cannot get the curtain down. The wife’s dismissal is surely the point the dramatist has been attacking. We have got so far, and we want no more. Mr. Buchanan thinks otherwise, and, for the sake apparently of gaining sympathy for his poor old German, he makes him bear the domestic burden on his own shoulders, screen his wife’s seducer, swear him to secrecy, put himself entirely in the wrong for no apparent purpose; and though, for all he knows or cares, the mother of his child may be starving, put on a dressing-gown, go into humble lodgings, and by poring over a ledger as a humble clerk redeem the honour and save the credit of the commercial house. But is the guiltless but silly wife forgiven? Naturally; it is Christmas time, the motherless child is dying, and the penitent, who was after all more sinned against than sinning, is welcomed to her home again by her venerable husband, who is positively forgiving enough to drink his scoundrelly partner’s health in a bowl of punch. The story is replete with human interest, and would be difficult to tell without occasionally arresting the sympathy or stirring the emotional chords of the audience. A mother whose honour is saved by the appearance in the drawing-room of an innocent child in its nightdress was welcomed last evening as a touching spectacle. The inner meaning of it is dramatic and admirable, but it is a dangerous incident on the stage. What we maintain is that dramas with such plots as these have been represented before now with far more art and unquestionably less artifice. In the days when “Daddy Hardacre” and “The Porter’s Knot” held the town, when these simple domestic stories were put forward to interest, to stimulate, and to touch the true emotional chord, the dramatist was contented to scorn all this elaborate contemplation of detail and to come to the point. Those who had to write for Bouffé or Robson would not have needed more than a couple of acts to tell this simple tale. First the crash, then the recovery. That is all we want. Nobody needs these wearisome scenes between man of business and clerk to impress the fact that the unfortunate man is ruined; the audience, alert and inquisitive, resents a prolonged business scene between partners and confidential advisers following the crash of an old gentleman through a conservatory window and the discovery of his wife in his friend’s arms. Then is the time for action, not for meditation. The outraged husband acts, he does not talk. We have alluded distantly to the acting of Robson, who was unquestionably the finest representative of this style of character in this class of play that the present generation has seen. Lafont was a more refined and subtle actor, but Robson had the power. Mr. Beerbohm Tree is, of course, too young ever to have seen Robson; but we wish he could have done so, if only to note the difference between that great actor’s method and his own in a character that should appeal at once and directly to the sympathies. Robson, or, for the matter of that, George Belmore, an actor of less genius but of quick nervous power, would never have dreamed of playing old Heinrich Borgfeldt in this particular way. They might not have equalled Mr. Tree in the mere minor detail and the studious elaboration of unimportant points of character. For instance, the German accent of the old fellow is all but faultless. Yet they surely would have moved their audience, stirred them, rivetted them, affected them to greater purpose. Having said what we have said about Mr. Buchanan’s play and his curiously perverse dramatic method, it is scarcely fair to Mr. Tree to hold him up to blame for what we may call dilatoriness of treatment, persistent over-elaboration of detail, and almost inexcusable dwelling over trifles. But of one thing we are perfectly convinced, and that is that the elaborate artistic method that this clever and observant actor brings to bear upon what are called character sketches will not do at all for parts of this description. If Mr. Tree is determined to tackle the emotional drama he must reduce the formality of his method. If Mr. Buchanan laboured with his dramatic scenes for the sake of favouring Mr. Tree’s love of detail, he made an artistic mistake, but, on the other hand, it is equally clear that no actor can properly affect his audience unless he quickens up, invigorates, and stimulates his art in scenes that require terse and telling acting. No one who ever studied that art could fail to be struck with the cleverness, the skill, and the observation of much of Mr. Beerbohm Tree’s performance. But it is not the style of acting that emotional scenes require. It was a bold attempt, it was a daring enterprise for a young actor. But his greatest admirers could have wished it had not as yet been attempted. He has not as yet gained the possession of that moving power or that brilliancy of attack which a Heinrich Borgfeldt requires. It is a Robsonian character, and some of us who have seen Robson know what that means. It means a succession of electric shocks; but that night there was not the sensation of a tingle. The character of Claire does not suit Miss Marion Terry. She was a good, pure-minded, innocent girl, pretending to be a weak, frivolous, unsatisfactory creature. She kept on telling us how silly she was, but no one seemed to believe it. The actress was not the woman the author evidently intended. Sometimes parts are badly cast—this was a case in point. Miss Marion Terry’s gentle, guileless manner does not suit a Claire who would have the determination to wreck a home or the nerve to encourage a showy lover. Miss Gertrude Kingston, a new-comer, came nearer the truth. This bold young lady, who evidently wants experience, the knowledge of using her voice, who has yet to be taught how to move and sit on the stage, and countless other things, still attacked one of the most disagreeable characters ever written for a lady, with wonderful nerve. She had made up her mind what to do, and she did it. A more objectionable personage than Mrs. Harkaway has seldom appeared in a stage play, but as the author suggested so did the actress follow his lead. It was certainly a clever performance—remarkably clever for a novice. One of the most carefully and naturally played characters in the drama was the quiet, sententious old clerk of Mr. H. Kemble. Coming after Captain Costigan and our old friend Eccles, Mr. Brookfield had a difficult task to extract much new fun out of the seedy, sponging actor father whose daughter has married into society. But though he over-dressed, and, as young actors will do, forced the “bit of character” into undue prominence, often spoiling the picture thereby, he made Mr. Algernon Bellair a fairly amusing person. Mr. Lawrence Cautley had a stagey part to play, and he acted it stagily. Miss Achurch and Miss Le Thiere were of great service in small characters; and little Miss Minnie Terry is a delightful child, natural, innocent, and pretty. She was not a stage child, but a real one, and seldom has infant taken the stage with more confidence, and less sign of having been parroted into her part. She had all the appearance of one quite used to the scene and incapable of nervousness. The play was, on the whole, very well received, and much applause was bestowed throughout the evening on Mr. Beerbohm Tree. The author did not appear, and the mention of his name caused a division of opinion. The same diversity of judgment will probably follow the fortunes of the play. Those who are not very exacting will like it very well when it has been brightened up and relieved of its redundancy; but in point of art it will not be considered very remarkable for its workmanship or its acting. The production last night at the Haymarket, London, of Mr Robert Buchanan’s new play “Partners” was the first important theatrical event of the year. Mr Buchanan candidly confesses that he has borrowed his hero from the character of the elder Risler in Daudet’s famous novel “Fromont Jeune et Risler aine.” But the story in its central idea is a far older one. Mr Buchanan’s hero is, in fact, one of those characters familiar on the stage and in fiction, of an elderly man who has married a young wife. He implicitly trusts her, and with her and his little daughter he leads a happy life. He even launches out into extravagances, all well within his ample means. A house far above his own simple German tastes, horses and carriages, a man servant, who is the bane of his master’s life, and whom his employer addresses with much unctuous reverence, he has secured for her sake. It is his trusted partner who breaks up this happy menage. That partner is depicted as weak rather than wicked. He and the old German’s young wife were boy and girl together. Now, however, he has a pretty girlish wife of his own, the only daughter of the man who first admitted the present head of the firm into partnership. The junior partner squanders the firm’s money, and dares to tempt his senior’s wife. All this is clear enough in the first act, and the rest of a very long story is devoted to the somewhat tedious unravelling of the plot. The erring woman commits no actual sin. Even when her lover breaks into her house at midnight, she is saved by the sudden appearance of the child who has missed its evening kiss. At last when the storm breaks, and the senior partner discovers all and suspects more than has really happened, he casts his wife forth, relinquishes all his own savings to save the firm from ruin and in order that the daughter of his old benefactor, who first admitted him to partnership, shall be kept in ignorance of her husband’s perfidy he voluntarily accuses himself as chiefly to blame for the fall of the firm, dissolves partnership (by word of mouth), and sinks to his old position as clerk. This is the most original and the least satisfactory part of the play. In the fifth act, which contains a somewhat involved Christmas scene, dramatic justice is done. When “Partners” is much abbreviated, and when many excresences bordering on farce are struck out, it should assuredly prove a powerful, and it is believed will be a successful drama. At present it is somewhat unequally played, although the characters of the elderly husband and his young wife are quite safe in the hands of Mr Beerbohm Tree and Miss Marion Terry. Mr Brookfield has the part of a broken-down actor, and the child five years old was last night prettily played by Miss Minnie Terry, the little daughter of Mr Charles Terry, and niece of Miss Ellen Terry. Robert Buchanan’s new play, “Partners,” was produced at the Haymarket Theatre to-night in the presence of one of the most brilliant audiences of the season. In an author’s note on the programme it was stated that the character of Dorgfeldt was partly founded on that of Risler in “Fromont Jeune,” by Daudet, but that the leading situations and most of the dramatis personæ were radically different. If by this Buchanan means that the names of the characters being changed and the wife white-washed makes the play radically different, it is so; but in fact it is in the main identical, and the resemblance to Daudet’s play is complete. It can be considered but an adaptation from the French author. The one string which is played upon is too fine to sustain the tension put upon it by the adapter, and what is considered the great scene of the play is lengthened by one-third more than was necessary or advisable. In its English shape the play is the old story of a confiding husband and a wife weak to the verge of guilt, except that the man who tempts her to dishonor her husband is his trusted partner. The usual misunderstandings produce a separation, which of course terminates as soon as one word of explanation is given. The play has some strong situations and many anti-climaxes, and is far from faultless in construction. It was respectfully listened to on account of the superb acting of Beerbohm Tree, who saved it from an early doom, although at the fall of the curtain hisses and applause were pretty fairly divided. If the piece ever succeeds it will require a great deal of compression and many alterations. The Red Lamp having burnt itself out, Mr Robert Buchanan’s play named above was produced on the evening of Thursday last, in presence of a crowded audience, that included many notabilities representative of art, literature, and fashion. The author of Partners acknowledges some indebtedness to Daudet’s admirable story “Fromont Jeune et Risler Aîné,” and chiefly for his drawing of the character of his elderly hero, which is partly founded on that of Risler. Mr Buchanan has erred mainly on the side of over-elaboration. The simple story he has to tell—a story often told before Emile Augier wrote his “Gabrielle” and since—is not equal to five acts, and so, five acts being considered necessary, the interest is weakened by being long drawn out, and something like weariness comes of vain repetitions and a multiplicity of needless detail. The most striking instance of this arises with the close of the play, where the long-looked-for climax having been reached with the reconciliation of a husband and wife, who have been separated through the man’s faith and the woman’s weakness, people in whom we have felt little concern are dragged on to assist in creating an anti-climax over a bowl of punch. If, however, the play has some faults, it has many merits, and these assured it even more than a respectable hearing; for there were scenes that were replete with human sympathy, and that not only moved the house to hushed attention, but conjured tears to the eyes of those who are not always given to the melting mood. The scene of the third act is Borgfeldt’s office, and here we learn that Derwentwater is a traitor to his partner, not only in love, but also in business. He has embezzled large sums of money, and he has brought the firm to the verge of ruin. When, presently, Borgfeldt returns, the true state of affairs is made plain to him by his old confidential clerk, Mr Parr. The evidence of the books convinces him of the financial disaster that threatens, but he is slow to believe that his wife is false to him. He fights against conviction, but conviction comes at last, and the poor old fellow is for a time overwhelmed by the double blow which brings dishonour to the hitherto prosperous “house” and dishonour to his home. In the fourth act the scene is again Borgfeldt’s residence, where his wife is giving a party all unconscious of his return. He suddenly makes his appearance while Charles holds her in his arms imploring her to fly with him, and to avoid exposure and disgrace. The guests are dismissed, and then the injured husband, in a scene with his partner, heaps coals of fire upon his head. For the sake of the scoundrel’s wife, who is the daughter of his dear old master, to whom Borgfeldt owes the position he has attained, Charles shall retain control of the business, and he—Borgfeldt—will take his place once more as a clerk in the office, will work night and day to avert the ruin which is impending, and will sacrifice himself to save the honour of the house. As for the weak and foolish Claire, believing her to have been something more and something worse, he takes from her her jewels; he drags even her wedding-ring from her finger; he orders them and all his and her fine possessions to be sold, and the proceeds to be devoted to the liquidation of the firm’s liabilities; and he drives her from his home with the wish that he may never look upon her face again. In the fifth and final act we see poor old Borgfeldt the occupant of a humble lodging, toiling at his books in the endeavour to put business matters on a satisfactory footing. Charles has disappeared, and he firmly believes that he has followed Claire. But Claire is close by waiting the opportunity to see her darling child. This opportunity is presently provided by her sister, the gentle Alice, whose advice she has spurned and whose remonstrances she has resented. And then comes the end, with, as will readily be guessed, reconciliation brought about partly by the child and partly by a letter which has long remained unopened, and which reveals the fact that Claire has been only weak and foolish and that her husband’s honour has been by her untarnished. The important part of Heinrich Borgfeldt was taken by Mr Beerbohm- Tree, who cannot be said to have done it full justice. At the outset he was thoroughly at home with his work, and all hearts went out to the simple-minded old fellow in his love for his wife and child, and in his desire for the happiness of both, while wonderfully diverting was the actor’s suggestion of Borgfeldt’s reverence for the newly established butler, whom he regards with the awe that might come of the presence in his house of the Archbishop of Canterbury or the Lord Mayor of London. Mr Beerbohm-Tree, too, may be credited with a powerful piece of work at the end of the third act, where the proofs of his wife’s perfidy are too strong, even for the great faith of the too confiding husband, and where, bowing his head upon his books, he breaks down with agonising sobs and vents his grief in a flood of tears. But the audience soon tired of Borgfeldt’s woes seeing that the actor became too slow and preachy in his method, and when, to the astonishment of everybody, the long-suffering and self-sacrificing German put on spectacles and presented the appearance of an octogenarian, everybody ceased to wonder that the young wife should have preferred the young and handsome lover to the old and unkempt and seemingly unwashed husband. Miss Marion Terry boldly attacked the difficulties of the character of the tempted wife, and gave us a telling illustration of the struggle between love and duty, her finest effect being created in the scene where Claire, ordered from her house, pleads, but pleads in vain, to be heard in her own defence. The villain of the play, Charles Derwentwater, was capitally represented by Mr Laurence Cautley. He made a very handsome lover, and he poured out his dishonourable passion as though he felt it. Decidedly one of the best played parts was that of Mr Parr, the head clerk, by Mr Kemble. This might have been a study from life, so eminently natural was it in every feature. A less welcome character was Algernon Bellair, father of Claire Borgfeldt. Bellair is described as a retired actor, and with his stilted speech and stagey stride he was made amusing by that clever actor Mr Charles Brookfield, but noting his miserable meannesses, his cadging propensities, and his actual dishonesty, we marvelled once more why, when a writer for the stage elects to represent the stage in one of his characters, the preference is so often shown for its seamy side. Mr Eric Lewis did well the little he had to do as “Mrs Harkaway’s husband;” and the worldliness and heartlessness of that lady were fairly set forth by Miss Gertrude Kingston, who, however, as yet lacks experience. This was her first appearance in London, and we may hope to see her to greater advantage, for she undoubtedly possesses a considerable degree of uncultivated talent. Mr C. Allan was vastly amusing as the butler, who, having served in aristocratic families, does not disguise his contempt for the middle classes; and Miss Janet Achurch played so well and so naturally as the heroine’s devoted sister that we could not but wish her more opportunity for the exercise of her ability. Miss Le Thiere gave distinction to the part of Lady Silverdale, an elderly lady, who, having been through the fire herself, works hard to keep the young and sorely tempted wife out of it, and a delightfully winsome and natural performance was supplied by little Minnie Terry as Borgfeldt’s child, Gretchen; while Miss Emily Grattan made a pleasing and satisfactory representative of Derwentwater’s wife. The fall of the curtain was followed by abundant cheering, but when Mr Beerbohm-Tree explained that the author was not in the house, the cheering was mingled with sounds of a less complimentary character. We incline, however, to the opinion that, with judicious alteration and compression, Partners should be assured of a fair measure of success. ON Thursday night Beerbohm-Tree produced Robert Buchanan’s new five-act play, Partners, at the Haymarket Theatre, and it gave me great pleasure to notice that the audience gave the work a thoroughly impartial and attentive hearing. At ten minutes past eleven o’clock the curtain had not risen on the last act, and for a few minutes the gallery whistled, plaintively, “We wont go home till morning,” but otherwise not a thing was said or done to disturb or disconcert the performers in any way. When the last curtain fell, however, the verdict of the impartial pit was very clearly expressed. Tree came forward and said, “Ladies and gentlemen, the author”—but the pit interrupted, “We don’t want him!” Despite this fact the fate of the play is by no means certain, for it has much in its favour to attract what are called “fashionable” audiences. The dresses of the actresses, for example, are in themselves a delight to smart ladies. The principal set scene is an artistic triumph of stage-carpenting, and above all the acting all round is particularly good. THE plot is thin to say the least of it. An old German marries a young and pretty wife. He goes away, and she flirts vigorously with his young and handsome partner. In a scene suggestive of Peril, she all but pulverises the seventh commandment, but is saved by the sudden intervention of her child. Then the old German returns, turns his wife out of doors, and says that he does not feel quite well. Subsequently he takes her to his arms again, and all ends happily. Three hours and a half of this sort of thing are a trifle wearisome; but, of course, it can be easily cut into proper lengths, and sold at a reduction later on. THE cares of management, multiplied by first night nervousness, naturally made Tree’s task a difficult one, when he attempted the portrayal of the old German. THERE was much in his performance of undoubted excellence, and it will be better still when he forces his humour a little less, and lets jokes about “Mr. Dickinson” come more unconsciously. His quiet pathos, too, I preferred to those scenes where he had to tear passion in tatters, and now and then he made queer, inarticulate noises that would have provoked the laughter of a less consistently fair audience. There are moments, too, when an increase of rapidity would enhance the force of the situations; but Tree no doubt knows all this just as well as I do, and probably by this time he has made the necessary alterations. Lawrence Cauntley was an impassioned lover, while the small part of a butler stood out most admirably in the hands of Charles Allan. Brookfield struggled nobly with a caricature nuisance that stopped the action of the story at every turn, and Kemble covered himself with glory as a confidential clerk. I wish to goodness Kemble would never try to be funny again, he is so excellently artistic, so manly, real and altogether perfect in parts that demand firmness, gentleness, and true pathos. OF the ladies, Miss Le Thiere did well as a sort of portly “Little Buttercup,” with admonition of “I told you so,” and “What did I tell you?” Little Minnie Terry was a capital child. Miss Janet Achurch looked nice and acted naturally, if a trifle despondently, and she wore sand shoes, I presume because she used to play in Sarah Thorne’s company at Margate. Miss Marion Terry wept and expressed the necessary emotion while acting most admirably in the Peril scene. Miss Gratton, in a very small part, was nice. The best performance of all, however, was that of Miss Gertrude Kingston, who, as Mrs. Harkaway, gave us a study of the modern woman of fashion that cannot be too highly praised. Her jerky walk, her short angular gestures, the quick, artificial, snappy voice, her every intonation proved the genuine artist and the keen observer. Nothing could possibly have been better, and I congratulate Tree on this admirable accession to his company. Mr. Beerbohm Tree’s talents as a “character” actor find special scope for their display as the hero of Mr. Buchanan’s new five-act comedy-drama, Partners, which was produced on Thursday evening. The part, that of Heinrich Borgfeldt, a middle-aged, uxorious German merchant, who speaks broken English, is acknowledged by the author to be founded on the character of Risler in Daudet’s Fromont Jeune et Risler Ainé, a tale that, in other respects, has been of use to Mr. Buchanan in the construction of his play. The story is a simple one, turning on matrimonial discord, in which a young and sentimental wife, an old man’s darling, encourages the advances of her husband’s partner, a despicable sample of human nature, who, in addition to invading the sanctity of the old German’s home, brings the firm to ruin by a course of extravagance and dishonesty. The wife, who has never gone beyond the sentimentality of flirtation, is aroused to a sense of decency and duty by the influence of her child, but not before being seen in company with the would-be seducer by the injured husband, who has just returned from Germany, and been apprised of the junior partner’s two-fold perfidy. The husband separates from his wife, and with his child retires to a humble home, and bravely sets to work to reinstate his fortunes. In this resolution he triumphs, while, at a later stage, proof is afforded him of his wife’s innocence, and the piece concludes with a pretty picture of the kindly German merchant restored to happiness; and, notwithstanding his past wrongs and sorrows, left sound enough in heart to even breathe good wishes for the man so cruelly wronging him. The piece is an interesting one, and contains strong dramatic passages, but they are weakened by prolix dialogue, and the development of the story is somewhat slow. Mr. Tree’s portrait of Heinrich Borgfeldt is artistically and quaintly designed, and deservedly wins very hearty applause by its many touches of humour, pathos, and homely dignity; and above all, by the elaborate working out of a very distinct conception of a character which is original and impressive. The child, Gretchen, is charmingly acted by Miss Minnie Terry, and the erring wife, Claire, has a sympathetic representative in Miss Marion Terry. Humorous relief is given to the play by the introduction of an amusing personage—a Mr. Algernon Bellair, the father of Claire, retired from the theatrical profession, and according to his own account favoured by Melpomene, but misunderstood by the public, full of “quotes” from the old dramatists, and sorely impecunious—a part that is played with much quiet comicality by Mr. C. Brookfield. Mr. H. Kemble, too, as Parr, Borgfeldt’s faithful old clerk, performs with feeling and dignity. The other noticeable characters are acted by Miss Gertrude Kingston, Miss Le Thiere and Mr. Lawrence Cautley. The play has been placed on the stage with much artistic effect, and was received with favour. A note from the management last night informs us that Partners has now been so judiciously curtailed that the performance concludes before the hour of 11. In the course of a few days it will be announced to commence at 8.30, and will be preceded by a new first piece. It is also decided to give morning performances every Saturday. That Mr. Buchanan has succeeded with his latest effort cannot be admitted; that he has, on the other hand, given a clever young actor a character in which a legitimate triumph has been secured is beyond doubt. Mr. Buchanan confesses that in his new play are “numerous suggestions” that have been taken from Daudet’s story, “Fromont Jeune et Risler Ainé.” With these we have nothing to do. The question is, what is the play like that has just been produced with such perfect stage management at the Haymarket Theatre? Is it a good acting play—one that will draw? Before answering this it will be well briefly to run through the plot of Partners. Heinrich Borgfeldt, a German, has been raised from the position of head clerk in an English merchant’s office to that of a partner. He is wealthy, and the soul of honour; his one idea in life is to do his duty, to keep the credit of his firm sound, its name untarnished. Borgfeldt has for partner in his business Charles Derwentwater, who is his very opposite in every way. Borgfeldt is old, and cares not for the gaieties of life; he is frugal in all things, save in securing the happiness of his young and beautiful wife, Claire. On the other hand, Derwentwater is young and handsome, a spendthrift, full of the pleasures of life, and is what is commonly called “a ladies’ man.” The result, according to the French school of thought, is evident. Derwentwater neglects his own wife, a simple, innocent girl, and becomes enamoured of Claire. She, poor foolish woman, is so fevered with his seemingly devoted admiration (chiefly shown by his presents of diamonds, bought at his firm’s expense), so mistaken with regard to her own husband, thinking his necessary attention to business neglect of her, that she half accepts her would-be destroyer’s vows, and for a time basks in a summer madness, which she thinks passionate love. In an evil moment Claire has listened to the advice of a friend—Mrs. Harkaway, “a woman of fashion”—who, in pique at Derwentwater’s turning from her own openly expressed admiration, soon manages to convince Claire that flirtation is not wicked so long as the husband remains in ignorance—that sin is not sinful unless found out. Weak-minded Claire, therefore, instead of boldly telling her husband all and turning her back upon Derwentwater, meets the latter half way, and without committing actual sin brings trouble and disgrace to her once happy home. Borgfeldt, owing to his firm having become involved in financial difficulties, undertakes a journey to Germany that he may secure money. Unsuccessful, he returns home to find his firm ruined, and seeming clear proof that during his absence his young wife has become the prey of his hitherto trusted partner. He is given a letter that has arrived at the office written by his wife and addressed to Derwentwater. This, which would explain all, he refuses to read, but instantly turns his wife out of his house. In the last act we find the old man living in comparative poverty, though he has once more placed the firm on a sound commercial basis. It is Christmas Eve, and as from outside his cottage he hears the message of “peace and goodwill to men,” carried to him by carol singers, the old man’s heart yearns that his wife, if innocent, may be with him once more. Claire, through the instrumentality of a mutual friend, Lady Silverdale, does return—the letter the husband refused to open is now read, proves her to be guiltless and faithful to her husband, and as the bells ring and the carol singers break out afresh, Borgfeldt takes his wife to his arms, and the curtain falls. This it will be owned is a simple tale that needs but simple and straightforward telling to make it successful. Instead of confining his play to two acts—quite sufficient—Mr. Buchanan makes the serious mistake of dragging the plot out through five weary acts that are crowded with unnecessary language, and hampered at every turn with anti-climax. True, the story of Partners is old—what of that? Old plots can be so re-dressed and clothed with rich ideas and beautiful language as to appear fresh and original. But no, Mr. Buchanan does not venture beyond well-beaten ground, his language is never above the average, his incidents are commonplace and tiresome. Take, for instance, the last incident in the play—the reconciliation of husband and wife. A dramatist who knew his work would have brought down his curtain upon the embrace. Mr. Buchanan, with a positive fondness for anti-climax, introduces punch drinking, and ruins the principal character, Borgfeldt, by making him drink to “Charles, my partner,” the very man who has tried to seduce his wife. Then again, in the office scene, Borgfeldt’s break down with grief should end the act, but Mr. Buchanan brings him back to common life by forcing business matters upon him—matters that should be finished with before the crushing news of Claire’s supposed sin is told. True that Mr. Buchanan has provided Mr. Beerbohm-Tree with a fine part in Borgfeldt, but he has also so constructed the character that few actors could gain for it the sympathy necessary for the success of the entire play. We have pointed out two instances that go far to rob the character of all pathos; a further one is where Borgfeldt, hearing the bells ringing and the carols sung, recalls the past. He is permitted but a moment to mark what there is of pathos in the incident before he is brought back again to the commonplace by an overbearing and quite out-of-the-picture character, “ a retired actor.” This character is conceived on the lines of the good old lend-me-half-a-crown-pay-you-to-morrow Micawber style, false to the state of the modern actor’s career and a blot upon the profession of the stage. It is very interesting to see what Mr. Beerbohm-Tree has done with this strange creation of the author’s, this Heinrich Borgfeldt. All who know this actor need not be told that the character is perfect as regards make-up and that his German-English accent is also true to nature. We have always considered Mr. Tree clever, we are now bound to admit that he has genius. Borgfeldt in his hands is a great, a noble conception brought to life and richly endowed with all the actor’s art. What faults are to be found with this performance are, we think, entirely due to the author. Mr. Tree has been censured for over-elaboration. All we noticed on the first night was apparently brought about by the over-anxiety of the actor in trying to render reasonably probable the inconsistencies and extravagances of an imperfectly drawn character. Mr. Charles Brookfield is admirably suited as Mr. Algernon Bellair, the retired actor, to whom we have referred. It is not Mr. Brookfield’s fault that Bellair becomes a nuisance at times, that his presence in certain scenes is destructive to art and to the general welfare of the piece. Mr. Brookfield does wonders with the part, and clearly proves his right to be looked upon as one of the most clever of our young actors. Another fine example of the actor’s art comes from Mr. H. Kemble, who as the head clerk, Mr. Parr, from the crown of his head to the sole of his foot, is true to life in every detail. The same remark applies to the Dickinson of Mr. C. Allan. Can anything be more amusing than the scenes between simple-minded Heinrich Borgfeldt and his grand butler Dickinson? They are splendidly funny; Mr. Allan plays like a true artiste. Mr. Laurence Cautley looks handsome and fascinating as Charles Derwentwater, but his acting wants heart and soul; not once did he on Thursday make us feel that Charles really meant to win Claire’s affections so that he might ruin her body and soul. Mr. Eric Lewis makes some amusement out of a small part, that of a henpecked husband; Mr. Stewart Dawson is fully competent as a doctor, and the two clerks are naturally played by Messrs. Harwood and Rodney. It is a rather difficult matter to speak of Miss Marion Terry’s Claire. Miss Terry is not the right lady for a part such as this. Her scenes with Mr. Cautley were on Thursday distressingly like rehearsals, there was little trace of that art that conceals art. In her scenes with Mr. Tree, Miss Terry acts as if Claire were a friend of Heinrich’s rather than his “darling frau.” Miss Achurch has little to do as Alice. She, however, looks the gently loving sister, and acts naturally. Miss Emilie Grattan, who has become quite a woman since last we saw her, is a pretty and innocent-looking Mary, and does all that is possible with the part; Miss le Thiere gives a well matured and most acceptable portrait of Lady Silverdale, while Miss Gertrude Kingston, a young lady who has wisely been gaining some experience in the provinces, gives an admirable study of Mrs. Harkaway. Her walk, talk and manners are well in keeping with this strange character; for Mrs. Harkaway dresses from head to foot in flaring red silk, she wears a single eyeglass, she whistles when Claire talks to her, she stands with her back to the fire after the fine old English gentleman style, she plays upon the piano like a woman without soul or manners, she snubs her little husband, and reduces him to the position of a pet dog; and, when leaving her friend’s drawing-room, she sneers at its occupants, and glories upon having brought misery upon its owner. To play such a dead-against-the-audience character, and succeed in gaining their applause, speaks well for Miss Kingston’s ability. A little child, Minnie Terry, daughter of Mr. Charles Terry, plays the tiny part of Gretchen with winning freshness. Perfectly free from all approach to staginess, this pretty infant gives her lines with such clearness and point as to make us think she has a natural gift. Great taste and liberality have been called into use over Partners. Nothing like Mrs. Borgfeldt’s drawing-room—for richness of design and perfection of detail—has ever been staged. The office scene in Act IV. also appears to be perfect as regards detail. The music introduced, “The Holly Berrie,” composed by Hamilton Clarke, is strictly in keeping with the old style of Christmas carol, while the incidental music, chiefly built upon German airs, is also from the same pen. Partners has, we understand, been in rehearsal a very long period, under the stage management of Mr. Edward Hastings, to whom is due the praise that the staging of the piece naturally brings forth. That Mr. Buchanan’s piece will succeed is pretty certain, and it will owe its success to its mounting and representation. We are pleased to learn that since the first night Partners has been considerably “cut,” and certain faults of construction remedied by Mr. Buchanan, and that now the performance ends before 11 o’clock. It is Mr. Tree’s intention that in a few nights Partners shall commence at half-past eight, so that a new first piece may be played. Monger.’ By Walter H. Pollock and Walter Besant. THOSE who adapt French novels to the English stage are not much better off than their brethren who transfer plays “ready made.” Similar difficulties have to be faced in both cases, and resort is ordinarily had to the same expedients. It would not be fair to class Mr. Buchanan among adapters. The central figure of his play is the same as in the ‘Fromont Jeune et Risler Ainé’ of M. Daudet. He has, however, departed widely from his original, and combined with much that is in that remarkable novel much for which he himself is alone responsible. None the less his difficulties are those of the ordinary adapter. Dealing with a story of feminine vice and masculine probity, he has been compelled to leave out half, and in so doing destroy the moral and the plot. That the Sidonie of the original could not be presented on the English stage may be granted. To substitute, however, for this grim type of feminine depravity the femme incomprise, of whom the world begins to pall, and to furnish a happy ending is to spoil a fine conception. Mr. Buchanan is entitled to claim that he has obtained a fairly sympathetic and, it may ultimately prove, a successful play. His work, however, is most uneven, and much of it infirm in construction. A psychological study at the outset, it ends like the mildest of domestic comedies. To call in the play-bills the last scene Christmas, and to surround the action with holly and mistletoe, is, perhaps, the most serious mistake that is made, since from the outset it tells the spectator who reads his play-bill that the issue is happy. Commonplace and trivial beside the wrongs of Risler are those of Heinrich Borgfeldt, his substitute. Yet he even is not without cause of grave complaint. His wife is not absolutely unfaithful. For this, however, accident is wholly responsible. Twice is she in the arms of her lover and on the point of surrender when she is interrupted, once by her infant, who, crying for her, comes at the critical moment into the room, and again by her husband, who, breaking through the French window, all but realizes the conditions of proof suggested by Iago to Othello. The heroine is, indeed, an idle wanton, to whom it is impossible to concede one spark of sympathy or commiseration. When her husband tears from her neck and hands the compromising jewellery, including even the wedding-ring, the justice of the treatment is conceded by every spectator. Will he forgive her? is the question asked. Looking at the play-bill, the audience finds the question answered. Interest thereupon disappears, and as the play is long, those present grow intolerant of anything that delays the inevitable termination. This is not the only important fault. As the play is arranged, the growth in the mind of Parr, the head clerk, of suspicion concerning the honour of Borgfeldt is sudden and inexplicable. For his refusal of his hand to his master some preparation should be made, or the incident should be suppressed. In like manner the cause why Borgfeldt takes upon himself the culpability for offences his partner has committed should be made clearer. Some scheme more promising than adding up the figures of his debts should be invented for the ruined merchant, who seems under the impression that to schedule his obligations is to meet them. Most important of all, perhaps, is to supply some motive stronger than is suggested for the infidelity of the heroine, which is thoroughly heartless and inexplicable. These alterations and others are necessary to render ‘Partners’ a good play. Less than these may, however, suffice to recommend it to public favour. Such success as it obtains will probably be due to the acting, which in many characters is excellent. Mr, Beerbohm Tree’s performance of Borgfeldt has the nervous power which the acting of this remarkable artist always exhibits. It is not lacking in intensity; but the chief merit is the manner in which, through his absorption in business, he shows his blind faith in the wife who on the first opportunity is prepared to fall from virtue. It is a fine performance. Miss Marion Terry idealizes the character of Claire, the heroine, and renders her so graceful and sympathetic we refuse to see her nature as it is. Mr. Brookfield presents an amusing type of a prolix and ebullient old actor, who measures by the standard of the past, and finds wanting, all modern histrionic accomplishment. Mr. H. Kemble in the old clerk gives a piece of robust and conscientious acting which is of much service to the play. Mr. Laurence Cautley as the would-be seducer does all that can be done with a difficult part, and Mr. Allan was amusing as a butler. In a character intended, apparently, by Mr. Buchanan to embody the detestable aspects of Sidonie which he dared not incorporate in the heroine, Miss Gertrude Kingston made an unsuccessful début. Miss Achurch as the sister of the heroine would with less effort make more of the part. It is a mere ingénue rôle, and in trying to assign it serious importance Miss Achurch injures it. Miss Le Thière plays an aristocratic old meddler. The reception of ‘Partners’ was favourable in the main. The new play at the Haymarket is all Mr. Beerbohm Tree, and it cannot be said to be Mr. Tree at his best. Mr. Tree has never been an emotional actor, and the part which he is now playing can produce no effect unless played by an actor who is wholly devoid of self-consciousness. Some very manifest absurdities in the character might then be overlooked, such as the uselessness of the head partner resigning the helm, and thinking to benefit the firm by resuming his place as a humble clerk. Moreover, Mr. Buchanan makes the elderly hero of “Partners” a kind of spoilsport, twice breaking up agreeable parties under his own roof. The scene in which he demands his wife’s jewels to sell for the good of the firm comes dangerously near the ludicrous; he did not give her the jewels, so clearly has no right to ask for them. The knowledge of life and manners on the part of the author seems ludicrously deficient; for what can we think of a lady described by one of the characters as “constantly leaving her box and interviewing her acquaintances in the stalls”? We can only say (as I heard a spectator in the stalls remark) “Quaint lady!” and pass on to other matters. In person Mr. Tree has undergone a complete transformation, and nothing could be more unlike the stealthy detective [ ... ] picturesque Gringoire of the “Ballad-monger” who pleads his cause with his lady-love while the soft strains of Maude Valérie White’s “Devout Lover” are played by the unseen orchestra. This time Mr. Tree impersonates a German, and his appearance and accent could scarcely be more perfect. As a study, the impersonation is very remarkable, but it smells of the lamp, and fails to touch the heart. It is, perhaps, the author’s fault more than the actor’s that Heinrich Borgfeldt is so silly and unsuspecting that he fails to gain our sympathies. To Miss Marion Terry is assigned the part of the senior partner’s wife, and she plays it with all the consummate grace and charm which is the birthright of the Terrys. The scene in which she returns to her child is specially good, reminding one of another scene in another play in which her sister draws tears from the eyes of the audience as Olivia takes leave of her tiny brothers before running away from home. Miss Achurch plays a small part very sympathetically. Miss Gertrude Kingston, a débutante, plays an unpleasant part in an unpleasant style, but she is not without talent. Miss Le Thiere does well as Lady Silverdale, and Miss Minnie Terry is the most natural child actress who has appeared on the stage for many years. Mr. Lawrence Cautley is fearfully conventional as the nefarious junior partner, of whose extravagance we hear so much, but of whose actual expenditure we have no proof whatever. We know he buys a single diamond necklace, but that would not ruin a firm. Mr. Brookfield is extremely good as a retired actor—a sort of Eccles. The most amusing thing in the piece is the impersonation of Mrs. Harkaway’s husband, played with genuine humour by Mr. Eric Lewis. Mr. Lewis delivers his speeches with great point, and his exit when his wife calls him away is one of the funniest things possible. The forced smile with which he shakes hands with the company before darting after his wife is excellent—he is so evidently one of those good amiable people who fear to offend anybody, and succeed in pleasing nobody. The audience is delighted with Mr. Lewis, and it is a mistake that his part is so short. Some ill-advised cuts have been made since the first night, with the result that several of the characters vanish into space after the first act and are no more seen. There is one good situation in the piece—one scene which is strong, and really dramatic—a love scene between the wife and the junior partner, terminated by the entrance of the heroine’s little child. Miss Terry wears some very pretty dresses in this piece—first a tea-gown of green velvet, with reverse and front of pale yellow gauze spangled with gold, the bodice made with very long square cut basques at the side, after the new fashion; next a toilette of pale pink, and then a really lovely ball-dress of white satin trimmed with a narrow line of dark brown velvet, the skirt opening at one side to reveal a panel of pale yellow veiled in folds of white lace. Miss Kingston wears a bright scarlet trimmed with black in the first act, and a very lovely dress in the ball scene—the front of pale green-spangled tulle, the train of cherry-coloured satin, which somehow or other is made to have a snaky aspect exactly in accord with the character. MR. H. BEERBOHM TREE bids fair to do for Comedy what Mr. Henry Irving has done for Tragedy. This clever young actor had already made his mark as a delineator of character unsurpassed for power of individualising, as witness his totally opposite creations, sketched above, of the original comic Curate in “The Private Secretary” and Macari, the cold-blooded villain in the weird drama of “Called Back.” Since Mr. Tree has had the good fortune to succeed to the managership of Mr. and Mrs. Bancroft’s handsome house in the Haymarket he has well sustained the finish and truth to nature of his own personal representations, and has placed on the stage the new pieces intrusted to him with a care and a magnificence which well entitle him to rank with Mr. Irving for artistic excellence. These distinguishing merits are conspicuous in Mr. Robert Buchanan’s new comedy-drama, “Partners,” which does not appear to have escaped hissing on the first night, but which on a subsequent evening, the piece having been judiciously compressed, went admirably. The central character and backbone of the play are derived from M. Daudet’s powerful romance, “Fromont Jeune et Risler Aîné.” Heinrich Borgefeldt, the character in question, is a middle-aged German, whose probity has won for him the senior partnership of his firm, a position which has gained for him also a fair young wife, Claire. But Claire evidently finds the attentions of the junior partner, Charles Derwentwater, congenial. Hence the tears of the German, who returns from his travels to find his firm ruined by Charles’s extravagances on behalf of Claire, and to imagine, on what appears to be good evidence, that his wife is about to elope with his seductive young partner. An old unopened letter convinces him of his error, and it is the means of reconciling Heinrich and Claire Borgefeldt in a touching Christmas scene. Heinrich Borgefeldt is one of Mr. Tree’s most artistic assumptions, and will tell the more when he infuses a spark of fire into the acting here and there. Mr. Laurence Cautley makes a fervid lover; and Miss Marion Terry a charmingly-graceful and natural Claire; while the Mrs. Harkaway of Miss Gertrude Kingston is decidedly clever, the Lady Silverdale of Miss Le Thiere is capital, and nothing could be more winsome than Miss Achurch’s Alice Bellair (whom the author ought to have given a sweetheart), little Minnie Terry’s Gretchen, or Miss Emilie Grattan’s Mary. Mr. H. Kemble is admirable as the confidential head clerk, Mr. Parr. Much laughter is occasioned by Mr. Chas. Brookfield’s humorous and true portrait of an old-school tragedian, Mr. Algernon Bellair; and justice is done to minor low-comedy parts by Mr. Eric Lewis and Mr. C. Allan. It has been officially announced that Mr. Robert Buchanan’s new play, “Partners,” at the Haymarket, has been so cut, altered, shortened, and improved since the “first night” that few would recognise it as the same play. There must surely be something radically wrong with our English system of rehearsals that allows a new venture to be jeopardised in this fashion. Presumably a stage-manager has a watch, and can tell—or ought to tell—to a second how long the performance will take at night. Where is the judgment, where the directing and governing power that passes and admits and consents to scenes that are obviously irrelevant, and pages of dialogue that are palpably unnecessary? Why should it be necessary for a first-night audience—mostly composed of experts—and for critics, whose experience is not without value, to point out when too late the little defects of a play what do it such incalculable mischief when submitted in a raw, unfinished, and incomplete state? The stage-manager in this instance stands condemned. We do not know, or care, who he may be. If he can with ease cut out a good hour from a play on the second night, and bring down the curtain sharp at eleven, then his want of judgment or decision is gravely at fault when he passes a play for the press full of overburdened scenes and redundant dialogue. The failure of “Frankenstein” at the Gaiety, on the first night, was due to inefficient and reckless stage management. The authors, the actors, the whole scheme of the play, were allowed to go by the board in order to allow the stage manager to indulge in a craze for overdecoration, overadornment, and unnecessary display. Such stage management as that is literally worse than useless. It argues an absolute want of familiarity with the text, an indifference to the relative and component parts of a piece, an absence of that supervision and grasp of effect that should be the province of the stage manager as much as of the professional critic. A stage manager who looks to one scene, and one scene alone, or to one actor and one actor alone, to make the success of a play, is destitute of the rare quality of experience. He does not understand the public whose tastes and idiosyncrasies he should study. 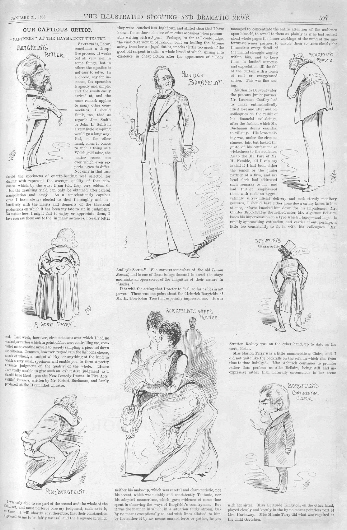 The fault of “Partners” on the first night was that author, director, stage manager, and almost everyone concerned had apparently combined to force upon the public the notion that the whole play depended upon the character of the old German who has married a young wife, and upon the acting of it by Mr. Beerbohm Tree. There never was a greater mistake. The character of the senior partner in Mr. Buchanan’s play is a leading one, no doubt; it should be interpreted by a clever and sympathetic artist; it is an important figure in the dramatic scheme: but the more you aggrandise the position of this old German, the more you lengthen out his scenes, the more you force him upon the audience, the more you compel him to act and go on acting to no purpose, the more you pick him out of a well-balanced comedy and pretend to make him a star part—the more you threaten the play with ruin. Heinrich Borgfeldt is not a star part, and no elaborate detail of acting, even if it were prolonged until two o’clock in the morning, will make it so. He has his work to do; when he has done it, let him be gone. This turning on the limelight on the actor-manager is the ruin of dramatic art. It is no good. No single individual is influenced by it in the least. It can be done practically and theoretically. At one theatre a trusty servant is sent into the flies to follow the manager with the limelight. His instructions are never to let him alone. It may be midnight, or daylight, or sunlight, or moonlight—it does not matter. Wherever the manager is, there must be the “lime.” This is all very well in a romantic theatre, but where comedy is performed it is not so easy. Then we have the theoretical limelight. The manager, if he can speak German, must speak German whether the play wants it or not. He may represent a man who has lived in London all his life and grown grey in the service of London commerce, but he must give an entertainment in imitation of a Dutch settler at the Cape. Whatever character he has to personate, it must be forced; whatever dialogue he has to speak must be lengthened; in whatever scenes he is engaged they must be dragged out until they become wearisome. Now, this may be managerial policy; but is it art? What would have become of “The Two Roses” if Mr. Henry Irving had been the manager cast for Digby Grant in accordance with this policy? The pretty play would have been spoiled for the sake of over-elaborating Digby Grant. What would have become of “Caste” if George Honey had been the manager playing Eccles? The audience would have been kept in their seats all night, to be entertained by Eccles. Mr. Beerbohm Tree, by diligence, industry, and art has forced his way to the front, and become the manager of the Haymarket Theatre. Everything that he does is clever. He is one of our most observant and ingenious actors. But do not let his friends persuade him that he must be a star or nothing. Don’t let his artistic judgment be blinded by power. It comes to this. Had the manager of the Haymarket not been an actor, would “Partners” have been dragged out an hour too long and several of its scenes spoiled for the sake of elaborating a character that required no emphasis or limelight whatever? No! the play would have been cut at rehearsals and not afterwards. The Haymarket venture will only succeed as long as ambition is tempered with self-denial. The success of an actor does not depend upon his being continually on the stage and persistently saying something; but on his saying what he has to say to the point, and not forcing himself into undue recognition. In a word, then, the story of “Partners” could have been told in half the space, and the character of the old German husband described in half the time. That air of earnest innocence and innate truthfulness that belongs to Miss Marion Terry does not suit the shifty character of a married woman who deceives her husband for mere perversity. This clever lady is always pretending to be the woman the author has sketched: but she deceives no one, not even herself. Claire is not a well-drawn character; but, well or ill drawn, it does not suit Miss Marion Terry. Miss Gertrude Kingston is a novice, but a distinctly clever novice. She has been required to play a vulgar, fast, and offensive woman; and one would fain hope that in no society are women so unwomanly or so detestable as Miss Kingston represents them to be. Amongst men the term “cad” is a horrible word of reproach. Miss Kingston enacts a female “cad,” destitute of grace, modesty, and all that men admire in women. Presumably there are such women in the world, but they are loathsome. Miss Kingston’s sketch of an innately vulgar and essentially unlovable woman is as clever and as repulsive as a picture by Van Beers. Every detail of vulgarity is studied, and the picture of modern womanhood by a woman makes the spectator shudder. It is realism strained to the utmost. The artist struggles to manufacture a type out of an exception. This is, again, the fault of Mr. Brookfield’s father of an actress who has gone into society. It is a caricature, not a character. It puts the whole play out of drawing for the sake of gratifying the caprice of an actor. No such man, dressed like that, with manners like that, with vulgarity of that kind, so assertive, so loud, or so impossible, would be permitted to exist in the atmosphere that Mr. Buchanan presents. What does the actor care for that? He has to make his hit, and he will make it at the expense of art. In the old days the low comedian got his laugh by painting his nose red or wearing a pair of loud check trousers. The comic actor of to-day is not a bit more artistic. His make-up is absurd; his manner, preposterous. We are convinced that this hunger for detail and elaboration in natural plays is a mistake. It is self-aggrandisement, not art. No two characters could have been more wilfully forced out of all proportion than those played by Mr. Beerbohm Tree and Mr. Brookfield—men who understand their art. Contrast them, for instance, wit the old, soft-voiced, natural clerk played by Mr. Kemble. He might have reddened his nose, or ventured on some extravagant make-up, or stood on his head or done something to attract notice. But he didn’t. He was true to nature and art. He was never once out of the picture. He was satisfying, convincing, admirable. This was nature. And the consequence!—an opinion unanimous that Mr. Kemble’s confidential clerk was the most consistent, well-balanced, and most admirable performance in the whole play. He was true to himself; it was not a leading part, but it delighted everybody because it was a sound and honest bit of acting. It is not the fault of Miss Le Thiere, but that of the author, that she is a bore, putting in her oar when she is not wanted, and wearying everybody with her disinterested advice. She does nothing, but she talks a great deal. Little Minnie Terry is a delightful child—pretty, natural, and unconscious. She has made the success of the young dramatic year, and so another generation of the Terry family passes into fame. Who was it that wept?—The London Correspondent of the New York Herald thus writes about the production of Partners at the Haymarket on January 6th:—“All the critics of the London Press were present, and, whatever they may see fit to write about the actors or the play, I can testify that several of them heartily applauded, and two of them stealthily wiped away tears in the last scene between Mr. Tree and Miss Terry.” And what was the matter with the man who saw them crying? MR. BUCHANAN’S “Partners,” produced at the Haymarket, and already, I was glad to find, a good deal amended and shortened since the first night, is really a very free adaptation of what is perhaps after all Daudet’s best novel. The play owes more to Froment jeune et Risler ainé than Mr. Buchanan thinks. In the record of his obligations he aims to be very precise, but he ends by being insufficient. What he has not managed to transfer or convey is the brightness of the story. The whole Delobelle group, for instance— tragic actor who has nothing in him, devoted wife, and that daughter, Desirée, who is as a figure torn from a page of Dickens—is but poorly represented in “Partners” by the single character of Mr. Bellair. Mr. Buchanan may say it does not aim to be represented at all, yet the idea of the neglected tragedian who has no value is assuredly from Daudet at a distance. But the originality of treatment which Mr. Buchanan, in his “Author’s Note,” endeavours to imply, refers chiefly, we suspect, to the fact that whereas M. Daudet let his heroine go over the precipice, Mr. Buchanan is careful to pull her up on the brink. Hence, greater acceptability, no doubt, to the British public; and hence, too, some loss of naturalness in the story. Mrs. Borgfeldt’s substantial innocence would have been in all likelihood established much sooner in real life than in Mr. Buchanan’s fiction; and—not to speak of anything else—in real life that letter which attests her incorruptibility would not have taken so long to open as it does at the Haymarket Theatre. Mr. Buchanan may nevertheless have something to say in defence—even in artistic defence—of the course he has pursued. Unfortunately, however, he cannot rebut the accusation of having produced a piece which, even now that it is shortened, has about it too large a measure of dulness. Interest of a kind it has also—one character is thoroughly studied—the sombreness is at certain times very effective. There are two or three fine scenes. But, on the whole, it must be uphill work for the actors; and without the aid of some very good acting indeed, the piece would have fallen to the ground. At present, what keeps it going is the impressive, and at times affecting, performance of Mr. Beerbohm Tree, and the admirable support which he receives from two or three of those who are associated with him. How long these things will suffice with a public moved by so many impulses—affected now by caprice, now by fashion, and now, one hopes, for a change, by sober reason—it is safest not to venture to prophesy. Let us address ourselves to what is most interesting and what will be remembered the longest—the manner of the performance. And first we will point out its defects. Mr. Brookfield, a very skilled character-actor, plays Bellair, the tragedian—the Delobelle of Daudet. Delobelle in the French novel has no blood relationship whatever with the Froment and Risler, here the Derwentwater and Borgfeldt, group. Mr. Buchanan makes him the father of the erring, or almost erring, wife, and of the wife’s well-behaved sister. Accordingly, there is even less room than in the French story for his obviously farcical carriage, and, at the present time of day, for a get-up presumably in imitation of a portrait of one of the Kembles by Lawrence, say, or Hoppner. At Mr. Brookfield’s performance we smile, and yet grieve. In the critical slang of the moment, the “note” is “forced.” The note is forced every bit as much by Miss Gertrude Kingston as Mrs. Harkaway, “a woman of fashion.” The playwright represents Mrs. Harkaway as jealous and disgustingly vindictive, but still “a woman of fashion.” Miss Kingston remembers the jealousy and vindictiveness, but not the bearing that would have compelled at all events a partial concealment of them. The lady’s place in the drama is that of one who is not looked upon as offensive by her associates—of one who, with well-bred people, takes a fair rank. But the actress so represents her that she could hardly for the second time be with well-bred people at all. You would watch not only your reputation, but every pocketable nick-nac in your rooms, while you talked to her. To be so obviously distasteful requires skill on Miss Kingston’s part, no doubt; but it is skill misplaced. Mr. Cautley’s Charles Derwentwater is, I daresay, a little colourless. It has no worse fault, and the part itself may compel that. Lady Silverdale’s part is sympathetic, and only wants in Miss Le Thiere a sympathetic voice. Heartiness she contrives to give it. A little child, Minnie Terry—Mr. Charles Terry’s daughter, I believe—is so entirely unconventional as Mrs. Borgfeldt’s little daughter that it is a pity Mr. Buchanan has not withheld from her the seemingly inevitable line from the good child to the depressed mother, “Mamma, why do you cry so?” Miss Marian Terry is, indeed, one of the most famous of tearful actresses; and she is here provided—after Borgfeldt’s quite unreasonable refusal to listen to his wife’s explanation—with all the motive and the cue for weeping which it would be possible to desire. She is somehow not at her strongest—the unnaturalness of the situation we may assume to be the cause of it—when she is listening to reproaches she is not permitted to answer, because if she answered them, the play would end too soon. But Miss Terry—who never actually fails in the accepted business of the stage—is individual and convincing in at least two passages: the first, where Mrs. Borgfeldt bids to her husband a hysterical adieu—an adieu charged with a secret; the second, where the brute passion of Derwentwater (whom the feeble wife so foolishly idealises) is, as it were, upon the very point of overcoming her. The part of Alice Bellair (Mrs. Derwentwater’s sister)—played by Miss Janet Achurch—is not a good one, but it is a mistake to say—as has been said somewhere—that it is the part of an ingénue. The ingénue assents to everything, and has no views of her own. Alice Bellair takes sides very distinctly, and carries her thought into action; and so Miss Achurch—always singularly real—is right in giving to the representation decisiveness as well as charm. Mr. Kemble’s performance of a part more telling, since more varied, leaves—it can hardly be disputed—as little to be desired. He is the confidential, high-toned servant of a great house, perfectly; exaggerating nothing, doing justice to every word. I have left Mr. Beerbohm Tree to the last, because, as Mr. Buchanan has managed things, his information alone can be elaborate and important enough to be the raison d’etre of the play. If it errs at all, it is through over-elaboration, over-lengthiness, that it errs. But I am not inclined to blame it. It has humane and homely touches. It has its pleasant suggestions of comedy. It is obviously forcible where poor Borgfeldt has to suffer horrible things in his unwillingness to listen to explanations which might have cleared everything up. And it has, among its several satisfactory, its one original and finely exciting effect: the moment at which—convinced of his wife’s falseness—the steady old merchant, loyal always to his “house,” addresses himself, in the house’s difficulty, with tearful valour, to the ledger. On the night I was in the theatre, that was done quite admirably. After all these details, is one to give one’s general impression of “Partners”? That would be, probably, that the piece has but a few merits; its performance but a few defects.